Author Khaled Hosseini's latest work Sea Prayer is informed by his work with the U.N. refugee agency. He begins by transporting the reader to the western city of Homs, which is where this particular father and son are from. I wish you remember Homs as I do, Marwan. fresh produce and bridal dresses. It is clear that the child never got to see that version of Homs. "It speaks to the experience of so many refugee children, whether we're talking about Syria or Afghanistan — an entire generation of children who are being raised amid turmoil and violence and war, and have no personal connection to the beauty and the richness of their country before all the turmoil began," Hosseini says in an interview. "And that's an experience that I've encountered in speaking to refugees all over the world." Hosseini is an ambassador for UNHCR, the United Nations' refugee agency, and recently went to Lebanon to meet with Syrian refugees. "And it is a hard, stringent and punishing life to be a Syrian refugee in Lebanon," he says. "One out of six people on the streets is a Syrian refugee. Most live on less than $4 a day in makeshift, improvised housing structures like abandoned garages and warehouses and, memorably, even a shopping mall that's unfinished and that smells like an open sewer and has no sanitation — and over a thousand people are living there. So it's a hard life. "And when I was speaking to these refugees, I could imagine how I too, as a father who would not be able to provide for his children, might choose also to pay smugglers and try one of these desperate crossing[s] across the Mediterranean Sea to reach European shores and try to secure a better life for my family." Sea Prayer was specifically inspired by one refugee. In 2015, a Syrian toddler named Alan Kurdi drowned, along with most of his family, while attempting to cross to Greece. The boy's body was memorably photographed both face down on a Turkish beach and being carried by a police officer. Hosseini says he was "bludgeoned" by the images. "As a father myself, I kept trying to imagine the emotional, psychological nightmare that his dad had to endure every time he saw the photographs of his son, and a stranger lifting his child's body — a stranger who didn't know Alan's voice or his laughter or his favorite toy," Hosseini says. "And so I hope that this book Sea Prayer is a small tribute not only to his family, but also, on a broader level, I hope it highlights the unthinkable despair that thousands of other ordinary people face every day to abandon home and community and take a chance on this brutal and often lethal journey across the sea." and how vast, how indifferent. How powerless I am to protect you from it. How I pray the sea knows this. "I imagine myself as one of the fathers who has abandoned home, land, community, who's been forced to walk across miles and miles, sometimes for weeks, occasionally for months, with his children, knowing that along the way he might be detained, that he might be beaten, that his children might be sold into forced labor — and then to reach the sea and put your life savings in the hands of smugglers and set out on the open sea, knowing that thousands have died before you attempting this very same journey, with nothing there to protect you — the sky pitch black, you can't tell the sky from the sea — nothing to protect you and your life at the hands of smugglers who have no regard for human life, and this whole business pivots on your suffering," Hosseini says. "Who would choose this for their family? If I was a father on a moonlit beach about to take one of these journeys, you can bet that I would ... say one of these prayers too." Vince Pearson and Reena Advani produced and edited this interview for broadcast. Patrick Jarenwattananon adapted it for the Web. You know our next guest for his books about Afghanistan - "The Kite Runner," "A Thousand Splendid Suns," "And The Mountains Echoed." But Khaled Hosseini's latest writing, "Sea Prayer," is a departure from those best-selling novels. This is a short, illustrated work of fiction that captures the trauma and heartbreak of the Syrian refugee crisis. It is told in the form of a letter from father to son. When I spoke with Hosseini, I asked him to read an opening passage in which the father is describing how their home city, Homs, in western Syria used to be. KHALED HOSSEINI: (Reading) I wish you remembered Homs as I do, Marwan - in its bustling old city, a mosque for us Muslims, a church for our Christian neighbors and a grand souk for us all to haggle over gold pendants and fresh produce and bridal dresses. I wish you remembered the crowded lanes smelling of fried kibbeh and the evening walks we took with your mother around Clock Tower Square. MARTIN: It is clear that the child to whom the father is speaking never got to see that. HOSSEINI: Yeah. And it speaks to the experience of so many refugee children, whether we're talking about Syria or Afghanistan, an entire generation of children who are being raised amid turmoil and violence and war and have no personal connection to the beauty and the richness of their country before all the turmoil began. And that's an experience that I've encountered when speaking to refugees all over the world. MARTIN: I imagine you've spoken with Syrian refugees about their own experiences as part of your work with the U.N.? HOSSEINI: Yes. I was in Lebanon this past June, and I met with Syrian refugees. And it is a hard, strange and punishing life to be a Syrian refugee in Lebanon - 1 out of 6 people on the streets is a Syrian refugee. Most live on less than $4 a day in makeshift improvised housing structures like abandoned garages and warehouses, and memorably, even a shopping mall that's unfinished and that smells like an open sewer and has no sanitation. Over a thousand people are living there. So it's a hard life. And when I was speaking to these refugees, I could imagine how I too as a father who would not be able to provide for his children might choose also to pay smugglers and try one of these desperate crossing across the Mediterranean Sea to reach European shores and try to secure a better life for my family. MARTIN: Was there a particular child or story or image that helped you create the tale that you tell in these pages? HOSSEINI: Yes. You know, three years ago, we all around the world were shocked to see the photograph of a young Alan Kurdi, a little over 2-year-old Syrian boy who drowned on a Turkish beach after his family tried to cross the sea to Europe. And when I saw that photograph of Alan's body on the beach, and I was just bludgeoned, you know. As a father myself, I kept trying to imagine the emotional, psychological nightmare that his dad had to endure every time he saw the photographs of his son and a stranger lifting his child's body, a stranger who didn't know Alan's voice or his laughter or his favorite toy. And so I hope that this book, "Sea Prayer," is a small tribute not only to his family, but also on a broader level, I hope it highlights the unthinkable despair that thousands of other ordinary people face everyday to abandon home and community and take a chance on this brutal and often lethal journey, you know, across the sea. MARTIN: I'd like to ask you to read another excerpt. This is the bit of the poem that begins, first came the protests. HOSSEINI: (Reading) First came the protests, then the siege, the sky spitting bombs, starvation, burials. These are the things you know. You know a bomb crater can be made into a swimming hole. You have learned that dark blood is better news than bright. You have learned that mothers and sisters and classmates can be found in narrow gaps between concrete, bricks and exposed beams, little patches of sunlit skin shining in the dark. MARTIN: This is not just a letter to a son. It is a prayer. Clearly, a connection to the tens of thousands of people who have taken that life-threatening journey by boat across the Mediterranean. Why did you decide to make it a plea to God? HOSSEINI: I imagined myself as one of those fathers who's abandoned home, land, community, who's been forced to walk across miles and mile sometimes for weeks, occasionally for months with his children, knowing that along the way he may be detained, that he might be beaten, that his children might be sold into forced labor. And then to reach the sea and put your life savings in the hands of smugglers and set out in the open sea knowing that thousands have died before you attempting this very same journey with nothing there to protect you. The sea - pitch black. You can't tell the sky from the sea. Nothing to protect you and your life at the hands of smugglers who have no regard for human life. And this whole business pivots on your suffering. Who would choose this for their family? If I was a father on a moonlit beach about to take one of these journeys, you can bet that I would turn inward and say a prayer for my son too. MARTIN: It is revealed that part of the father's motivation is that he just wants to make his son feel OK and that he wants to believe that the prayer will be heard. He's afraid that it rings hollow. May I ask you to read the close of the poem? 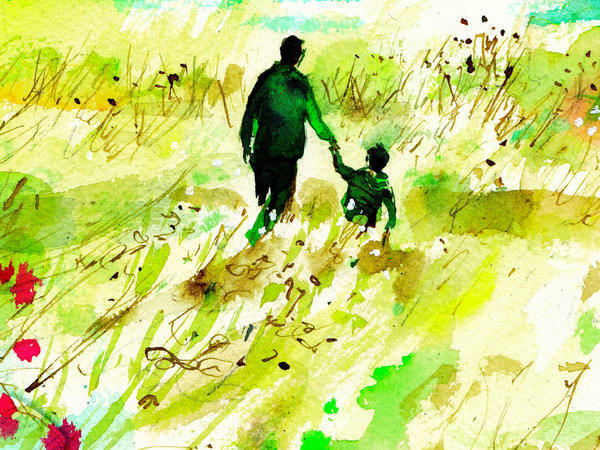 HOSSEINI: (Reading) These are only words, a father's tricks. It slays your father, your faith in him, because all I can think tonight is how deep the sea and how vast, how indifferent, how powerless I am to protect you from it. All I can do is pray, pray God steers the vessel true when the shores slip out of eyeshot and we are a fly speck in the heaving waters, pitching and tilting, easily swallowed. Because you, you are precious cargo, Marwan, the most precious that ever was. I pray the sea knows this, inshallah, how I pray the sea knows this. MARTIN: Novelist Khaled Hosseini. His latest book is called "Sea Prayer." Thank you so much for talking with us. HOSSEINI: It was my pleasure. Thank you for having me. (SOUNDBITE OF DHAFER YOUSSEF'S "BIRDS CANTICUM 'BIRDS REQUIEM' SUITE") Transcript provided by NPR, Copyright NPR.